The southern region of Thailand, where the Ban Ton Sae STEF site is located, really has only two seasons – the wet and the dry. These seasons do not occur at the same time on the east and west sides of the southern peninsula. On the west coast, where STEF is located, the southwest monsoon brings rain and often heavy storms from April through to October, while on the east coast the most rain falls between September and December. 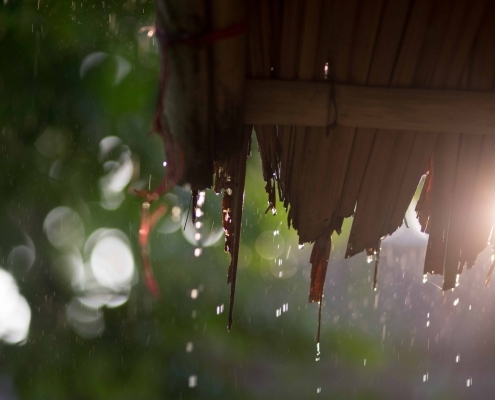 Overall the southern parts of Thailand get by far the most rain, with around 2,400 millimetres every year, compared with the central and northern regions of Thailand, both of which get around 1,400 millimetres. Because of this, before the next stage of laying the turf, it has been necessary to equip the site with sufficient irrigation and drainage. As the weather is naturally unpredictable, the irrigation was installed as a backup for any prolonged dry spell. It was vital to select the correct sized water pump and this was then connected to a water supply linked to source of the pools. These pipes were then directed up and along the slope by the pools to where the turf is planted, with specially-designed holes to regulate the release of water along the pipe. 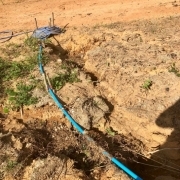 With the drainage, we have to ensure the site does not flood as this could lead to erosion of the loose, freshly-moved soil, and damage to the turf by over saturating it. 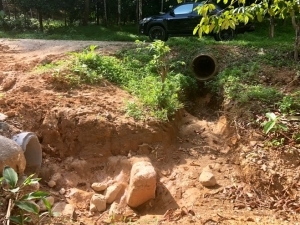 We had 25 sections of large concrete drainage pipes delivered and installed in order to prevent this soil run-off and flooding. If you can help us with this practical and essential infrastructure work, please do. The elephants deserve the best. You can donate if you click here. 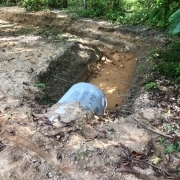 But do come back next week to read about the next stage of progress on the Ban Ton Sae site!